Impromptu tricks for audiences who speak little to no English. I can't think of anyone better qualified to write this than Ken de Courcy. He and Susan take at least a couple of holidays a year to strange exotic countries where the inhabitants speak little or no English. He doesn't, like some magicians, drive his wife potty by carrying an extra suit-case filled with miracles so that he can show off to the natives. Just a few things which mostly are multipurpose. I've watched Ken doing the majority of the things he details herein and they are all blockbusters. You'll find some old favourites (which everyone takes for granted) receive more of a going over here than anywhere else. 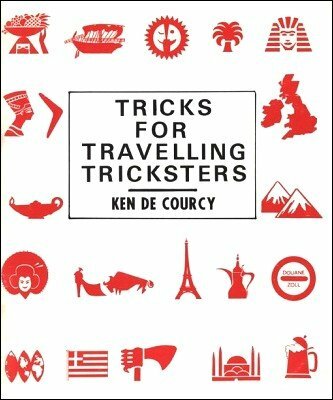 Travelling a lot as I do, I often meet up with the sort of situation that Ken is catering for; I realise the worth of what you will find herein and I hope, after reading it, you will too. Don't read it for the secrets. Read it with the idea of doing it. You will earn the thanks of your audience and leave them with the correct impression they SHOULD get, rather than the one they almost certainly WILL get if you just stuff a load of tricks into your pocket and drag them out and do them in any order, mixing newies, oldies and "I read the instructions once" effects. Ken can bat on for an hour of good solid entertainment with what's in here. Maybe you won't manage that straight away, but may I suggest you have a good try at it. The experience that you will get from working your magic under the far from good conditions which so often pertain in this sort of work will give you that much more pizzazz when you find yourself in good situations with English speaking audiences. You'll be very surprised to find out how much this will improve your performance, both in working with authority and confidence AND being more entertaining as a result.